The anti-spirals launch their attack on earth, while Rossiu tries and imprisons Simon. 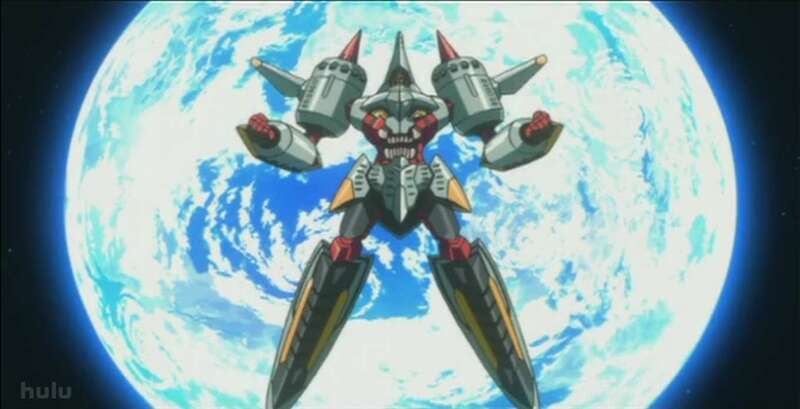 However, as the situation becomes ever more dire, Rossiu has no choice but to let Simon pilot Gurren Lagann once again in order to defeat the anti-spiral attack and save Earth. Go Gundam Go! Oh wait...what? I think the start of this series of episodes was going pretty good – it continued on the arc dealing with the political instability of the human’s new society, and I thought that was going in a good direction. However, I think it started going a little downhill when Rossiu decided to try and sentence Simon to death. I could get the arresting him part, but just realistically, I’m not sure how Rossiu would be able to survive by doing such a thing when pretty much literally everyone else in the government disagreed with him. I suppose the temporary calm he brought might have been enough to not go against him, but I just felt that there would be no way Simon’s friends would just stand by at let Rossiu execute him. After that, it was basically fighting, fighting, and more fighting. I think Gurren Lagann leveled up twice in one episode, first by joining with the arc, and then joining with the Moon, which naturally was a Gunman itself. And what happened to all the debris that fell off the fake moon when the gunman was activated? I’m sure that did a nice piece on the earth when it crashed into it. Anyway, after they started fighting again, the series seems to have devolved into people screaming, Gurren Lagann leveling up, people screaming, leveling up, more screaming and so on. Hopefully now that they’re going after Nia and the anti-spiral homeworld, things will start to improve again on the storytelling front.